Note: This Nintendo Switch release is actually two games in the one package. So we've reviewed both, and then the score at the bottom reflects the combined purchase. 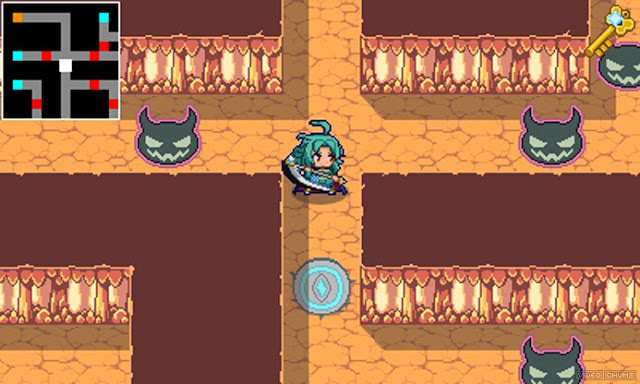 Brave Dungeon is a spinoff dungeon crawler developed by Japanese indie studio INSIDE SYSTEM, building on the Legend of the Dark Witch system which graced the 3DS eShop. Whereas the Dark Witch games were lighthearted platformers, Brave Dungeon is a lighthearted dungeon crawler, and on the Switch it comes prepackaged with another lighthearted trading card game in Dark Witch Story: COMBAT. I hate to repeat myself, but these are not games to be taken seriously – they’re light, airy fun which simplify their respective genres to make something which isn’t too mentally taxing. Brave Dungeon’s biggest strength is its bounciness. Whereas I don’t consider JRPG’s to be a genre well suited for travelling, or for people with short attention spans, Brave Dungeon’s distilling of combat, exploration and crafting has the player doing something new every few seconds. Dungeon floors get cleared in minutes, bosses are challenging but fall to simple battle plans and character development is as easy as navigating a menu or two. 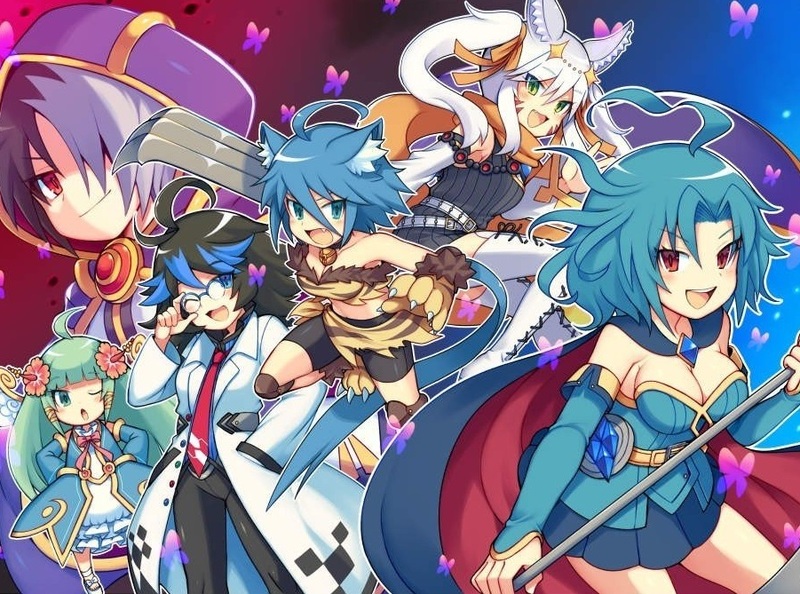 Paring away all the non-gameplay elements of the JRPG genre leaves behind a super strong gameplay loop of dungeon crawling, light party management, and diving right back into the next dungeon. Unfortunately, this also leaves the game feeling a little contrived – without any narrative to contextualise the combat, and without any complex combat options to encourage players to strategise and earn their victories, Brave Dungeon’s primary method of player engagement is grinding for avatar strength. Which isn’t necessarily a bad thing, mind you, although players should know exactly what they’re getting into. I did get strung along for hours, grinding the same dungeons and monsters over and over in order to unlock the next skill, and then defeat the next boss, and then craft the next equipment item, and then do it all over again. There is lots of grinding involved – most of which is mindless. It’s somewhat comforting after a long day, or on a 15 minute bus ride where you don’t want half your playtime to be setting up your party or reading flavour text. Grinding tends to bother me if it’s a filler between a game’s more exciting narrative segments or boss battles, but here it’s all that there is and it’s a lot more agreeable. There is some light strategy involved – each character can equip accessories which buff their stats or offer slight combat bonuses, enemies have their own attack patterns and by levelling up you can unlock a few skills which give more situational options to combat. There’s a very simple crafting system which panders to completionists, though it’s still entirely possible to beat the game using nothing but basic attacks and the starting equipment. Bosses have the potential to stump players for a while – it’s interesting to work out whether your current level of avatar strength is enough to beat a boss while fighting that very boss – but if you’re looking for deep strategy then this isn’t the game for you. There’s lot of small things to like about Brave Dungeon; some of the monster designs are very funny and there’s enough content to keep you going for a while. It’s an excellent game for someone who needs that JRPG hit without having the time or emotional energy to invest in something deeper. That being said though, it is a very shallow game at its core, and if you’re not expecting that at the onset then you might walk away feeling disappointed. It’s probably best to think of Dark Witch Story: COMBAT as what Triple Triad was to Final Fantasy VIII, or what Gwent was to The Witcher 3 – addictive and not-very-well-balanced side distractions to a much bigger main quest. If you came here to get away from the grinding in Brave Dungeon, get ready for some more grinding because that’s what this game really is. It uses the monster sprite assets from the Dark Witch series, but it’s devoid of story aside from a vague tournament arc framing device and it boasts only the lightest of strategy elements. The game is played between two people – each picks three monster cards, each with a health, Syega and attack stat. The Syega of all three cards pools together and forms a kind of currency that is used to purchase equipment items for the cards. Then, after everything is set up, the cards do battle one pair at a time. Monsters take turns to attack, although sometimes they can attack twice in a row, and they use their hold item whenever appropriate. Each card also has a rock, paper or scissors symbol and if your card has the symbol which beats your opponent’s, your monster can occasionally perform a crit attack for massive damage. After three fights have occurred, the player who won the most fights (regardless of margin) is declared the winner. It’s impressive just how much RNG this combat system features. In the single player tournament mode, you can see what cards your opponent will use, and what hold items they have, but the order of their cards is random. Because of this, it’s random whether you will have an advantage or a disadvantage in the rock-paper-scissors setup, but that doesn’t matter because crits also occur randomly. 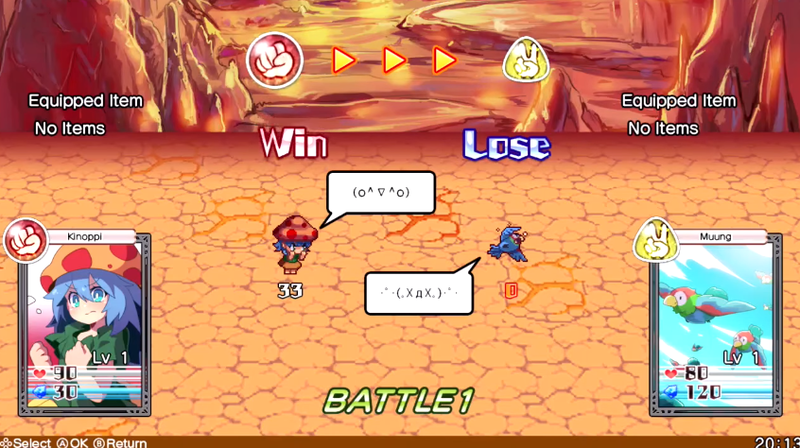 There’s also the randomly proccing double-attack which can absolutely turn the tide of a fight. Battles are completely non-interactive too, so once you set up your party it’s all up to the RNG to decide whether it’s a win or a loss. In the single player mode, players must work through a variety of leagues by defeating sequential challengers. Cards can be levelled up with experience and powered up with currency earned from winning fights, but that’s slow going so be prepared to do the same battles many, many times. After battles you might also unlock more cards to work with, and while there’s a little bit of strategy involved (some cards might specialise more in HP, or attack, and some combos of cards in a team offer additional perks) there’s nothing stopping you from grinding the first three cards you obtain to max level and then destroying the competition. Multiplayer is virtually pointless since the game is so devoid of strategy. 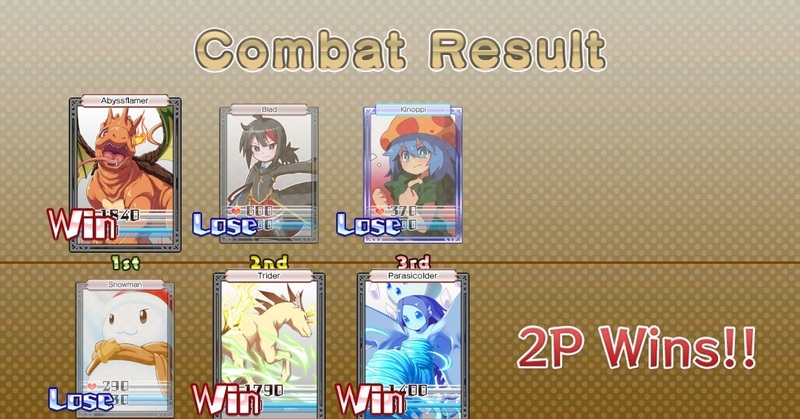 It’s a shame there isn’t an option to pit two teams of cards earned from the single player mode against each other – instead, players draft cards randomly via gatcha. The 2-player mode somehow makes a game which is entirely luck based even more luck based. I don’t recommend it unless your friends also enjoy betting on coin tosses. Dark Witch Story: COMBAT is, ultimately, more grinding. I found this one more disappointing than Brave Dungeon because the combat is so random that you don’t quite get the same sense of progression. If you’re looking for a strategic TCG game on the Switch, this will just make you sad.